Early traces of settlement in the area of Lyons date from 12,000 BC. There is no evidence of continuous occupation until the Romans arrived, and the city was founded by Lucius Munatius Plancus in 43 BC. The first French martyrs, forty-eight of them, died for the faith on the hill of Fourvière in 177 AD. 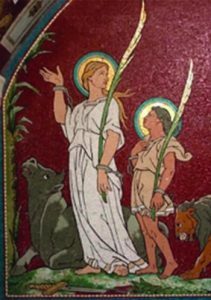 The most well-known of them were Pothinus, a bishop, and a young woman called Blandina, who was 15 years of age when she was devoured by wild beasts. The second bishop of Lyons, who succeeded Pothinus, was Irenaeus, who is said to have lived into the 3rd century. 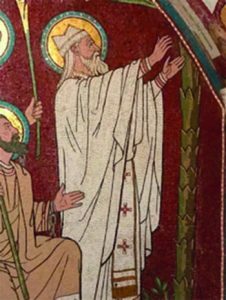 Irenaeus was a follower of St Polycarp, who was a friend of St John the Evangelist. Thus, the Christian memory of Lyons has a direct line to Our Lord. 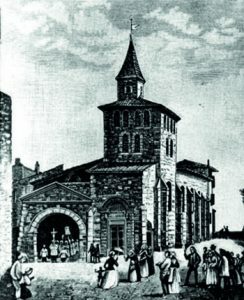 In early Marist history, the city and the diocese of Lyons played an important part. It was in Lyons that 12 young men promised to begin the Society of Mary in the early 19th century. Fourvière has been a place of pilgrimage dedicated to Our Lady since 1170. 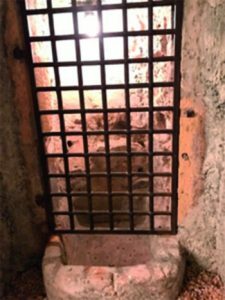 It had become even more popular after its re-dedication by Pope Pius VII in 1805. 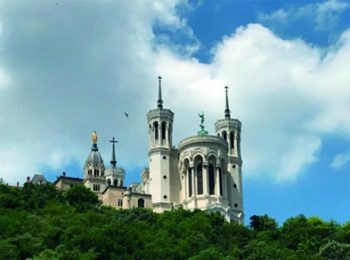 The chapel of Our Lady of Fourvière has been rebuilt a number of times, the last major work being undertaken in 1851-52, when the steeple was replaced by a tower with a golden statue of Our Lady, sculpted by Joseph-Hugues Fabisch, at its peak. The Basilica, built in the 19th century next to the chapel shrine of Fourvière, stands on the site of the ancient Roman forum of Trajan. The first Marist aspirants held meetings in St Irenaeus seminary in Lyons during 1815. Eight of these men were ordained by Bishop Louis Dubourg, the Bishop of New Orleans, U.S.A., on 22 July 1816. 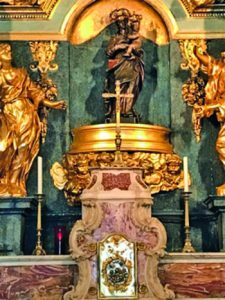 It was in the Fourvière chapel on the next day that the eight newly-ordained priests and four seminarians pledged to begin the Society of Mary. 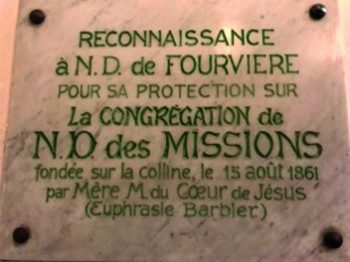 They placed the document they had signed promising to found the Society, on the altar or, according to another account, under the corporal on the altar, while Fr Jean-Claude Courveille celebrated Mass. On the left of the chapel’s sanctuary there is a plaque in memory of this event, and on the right side there is a plaque commemorating the Marist Brothers. 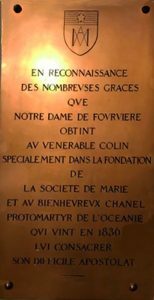 There are a great number of such plaques in the chapel, among them, one in thanksgiving for the Sisters of Our Lady of the Missions. Down the years, many Marist celebrations have taken place at the shrine. 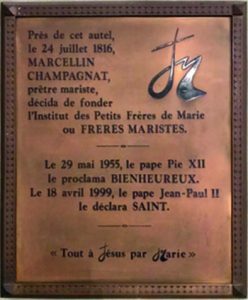 On 29 August 1833, a Mass was celebrated there before Frs Colin, Chanel and Bourdin left for Rome to present the plan for the Society of Mary to Roman officials. In October 1836, before the departure of the first missionaries for Oceania, Bishop Pompallier had a novena of Masses said there. 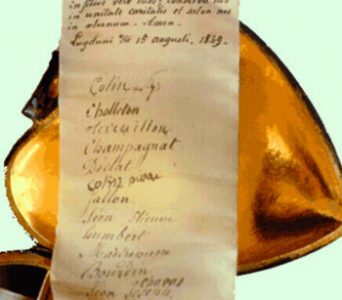 On the first day of the novena, Fr Peter Chanel hung a heart containing the names of the missionaries around the neck of the infant Jesus. The Basilica of Fourvière was consecrated in 1896, in thanksgiving to Our Lady for the protection of the city and the defeat of the Prussians during the Franco-Prussian war of 1870-71. 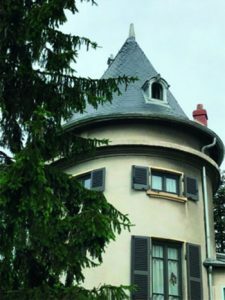 The first meeting of the Marist Laity was held in a round tower a few minutes’ walk from the shrine. 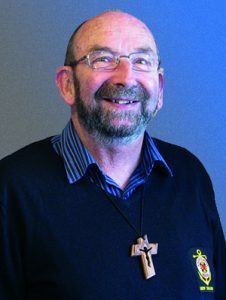 A group which was called the ‘Institute of the Tertiary Brothers of Mary’ was run by a M Colard, who had the title of ‘Rector’. Colard purchased the tower house in 1823, and this was the meeting place for the first Third Order group. This building was also the novitiate house for priests who wished to join the Society of Mary. It is now in the grounds of St Irenaeus seminary, which, in the time of the early Marists, was in central Lyons.